If you’re a longtime user of OS X, you’re probably familiar with Apple’s Digital Color Meter (found in Applications > Utilities), a simple utility that magnifies the contents of the screen under the mouse pointer and lets you copy the RGB color components of the resulting pixel. 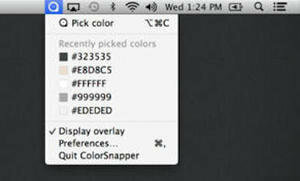 ColorSnapper (Mac App Store link) takes the concept a little further, providing a convenient way to instantly capture a specific color from your screen in a variety of formats. Once installed, the app becomes available in your menu bar, from where it can be invoked either via a mouse click or by using a global shortcut (the app defaults to Command-Control-C, which may interfere with the functionality provided by other apps, but you can change the shortcut). The app runs quietly in the background until you call it into action, at which point, just like Digital Color Meter, it shows a loupe that magnifies the area around the mouse cursor. Clicking anywhere causes the color of the pixel beneath your pointer to be copied to the clipboard in one of several formats, from bare RGB or HSL values to pre-formatted strings that can be used in a graphics editor like Photoshop, or in a Web page’s cascading stylesheet. If you often need to identify colors on your screen—from a Web page or photo—and don’t need the extra functionality provided by an app like The Icon Factory’s xScope, ColorSnapper is a great tool that focuses on one task, executes it well, and will only set you back a small amount of money.